DURHAM, N.C. -- Now that President Obama has put climate change back on the table in his second inaugural address, a new national poll finds growing public support for regulating greenhouse gas emissions and requiring utilities to switch to lower-carbon fuel sources. The percentage of Americans who think climate change is occurring has rebounded according to the Duke University national online survey, and is at its highest level since 2006. The study also finds that while Americans support regulating greenhouse gas emissions, they do not favor market-based approaches such as cap-and-trade or a carbon tax. Sixty-four percent of Americans strongly or somewhat favor regulating greenhouse gas emissions from power plants, factories and cars and requiring utilities to generate more power from “clean” low-carbon sources. Only 29 percent strongly support or somewhat support a carbon tax. Returning revenue to taxpayers through a $500 tax rebate only slightly increases support for a carbon tax, to 34 percent. The survey indicates that many Americans haven't formed an opinion about the cap-and-trade approach: although support is low, 36 percent are neither for nor against. The Duke University study examined public attitudes regarding climate change and the major policy options that President Obama might pursue in his second term. It was conducted by Frederick Mayer and Alex Pfaff of Duke's Sanford School of Public Policy and Adair of the Nicholas Institute. The percentage of Americans who agree there is solid evidence of a changing climate has steadily increased since 2010, based on an analysis of several national climate change polls. The Duke poll found 50 percent of Americans are convinced the climate is changing and another 34 percent say it is probably changing an increase from other recent polls. 54 percent feel climate change is primarily the result of human activity. There are strong partisan differences in the perceived seriousness of the problem. About half of Democrats say it is “very serious” while 35 percent of Independents and 17 percent of Republicans agree. 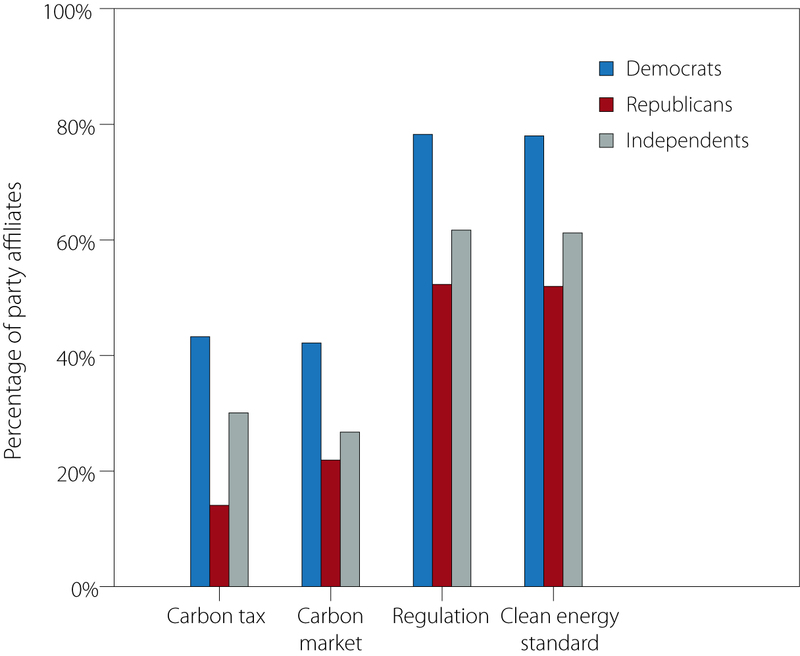 Although Democrats are more willing than Republicans to support all policies, the preference for a regulatory or clean energy approach is shared across party lines. The Internet survey was conducted Jan. 16-22, 2013 by Duke in partnership with KnowledgePanel and involved e-mails to randomly selected households throughout the United States. The margin of error for 1,089 respondents was 3 percentage points. Funding for the survey came from Duke's Climate Policy Working Group. Note to broadcast editors: Duke provides an on-campus satellite uplink facility for live or pre-recorded television interviews. We are also equipped with ISDN connectivity for radio interviews. Broadcast reporters should contact Scott Wells at (919) 660-1741 or James Todd (919) 681-8061 to arrange an interview.